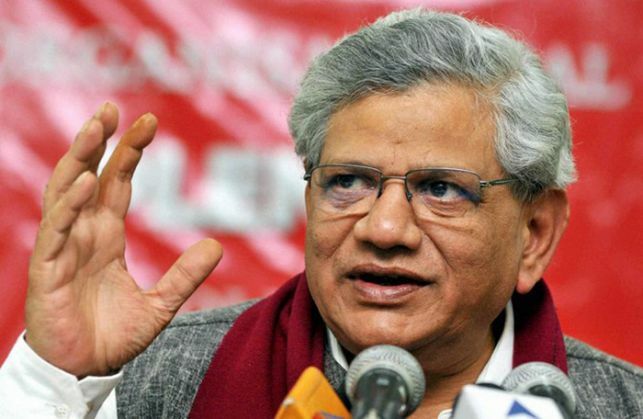 Asserting that the Centre must train their focus solely on improving people's livelihoods, CPI (M) General Secretary Sitaram Yechury said on Monday that the Annual Budget cannot be another exercise in 'Jumlanomics' and that it must be in the service of the common man. "So much Cess and Excise-excess this past year. Nothing has benefitted groaning Kisans and common people. Budget must account for that. Budget cannot be another exercise in Jumlanomics. Sarkar must focus on improving peoples' livelihoods. #NoDataFudge." Yechury said in a series of tweets. Earlier today, Minister of State (MoS) for Finance Jayant Sinha said, that under the guidance of Prime Minister Narendra Modi a wholesome Budget had been formed, keeping the suggestions of everyone in mind. "The Prime Minister has given us the guidance that when faced with a test, we must be fully prepared and rest. At 11:00 clock you will see what the Budget has to offer. We have really worked hard for this and prepared a lot. Under the guidance of the Prime Minister and the Finance Minister, we have been working in the service of the people," Sinha told the media here. Stressing that the Budget was a test in itself for the Centre, he added that the nation will be grading them as the Budget unfolded. "We have taken everyone's opinion and advice into consideration in forming the Budget. There are many challenges and we have tried to that keep everything in balance, so we can help the nation," he added. Prime Minister Modi said yesterday in his Mann ki Baat address that the Budget is his exam and that 125 crore Indians will be testing him. "I am healthy and full of self-confidence. Let us hope my exams that start tomorrow and yours the day after are good. If we succeed, the country will succeed," he said. The Congress, however has made an ominous prediction saying that nothing except 'platitude' should be expected from the General Budget 2016-2017. "The way our economy is, everybody knows that except for platitude, nothing is going to happen in this budget. Rather than making wild announcements on the radio, the Prime Minister should give a direction to the economic policy to see how we can come out of the mess that his own government has created," Congress leader Sandeep Dikshit told ANI. Meanwhile, Finance Minister Arun Jaitley arrived at the Parliament where he will announce the 2016 General Budget.